Planning a Smoky Mountain vacation with a stay in a cabin in Pigeon Forge? Check out the beautiful log cabins in Pine Mountain Resort! Similar to the cabins of Sky Harbor Resort in the Smokies, these Pigeon Forge rentals boast terrific views and a great location only minutes from town. You and your family will love a terrific cabin vacation at Pine Mountain in Pigeon Forge! During the day, these cabins boast great views of the Smoky Mountains and the valley of Pigeon Forge. At night, the sky lights up with the dazzling lights of the Pigeon Forge Parkway. With these lovely log cabins atop mountains near Downtown Pigeon Forge, you can experience the best of rustic beauty and convenience to fun attractions in town! These Pigeon Forge cabins near Downtown with views also offer guests quick access to the top attractions in the area! For you vacation, you can stay only minutes away from Dollywood, the Gatlinburg Golf Course, and go kart racing at the Track. Additionally, guests here will find great shopping and restaurants at the nearby Island in Pigeon Forge. Other top entertainment options include the Comedy Barn and dinner theaters like Dixie Stampede! 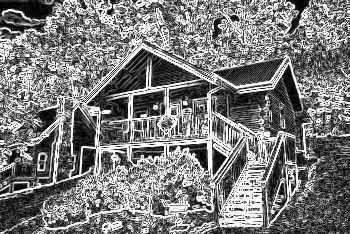 Guests of these log cabins in the Pine Mountain area will also enjoy quick access to both Wears Valley and Gatlinburg. Wears Valley is a peaceful mountain community just outside of the Great Smoky Mountains National Park boundary. Gatlinburg is another top destination in the Smokies with a cozy downtown area with plenty of restaurants, shops, and attractions. While there's plenty to experience a short drive from your cabin in the mountains, you may just want to relax in your Pine Mountain cabin rental surrounded by the beauty of nature. With gorgeous mountains rising up in the distance and the peaceful sounds of the forest, many guests will love kicking back on their cabin's deck. Don't forget to book online with Cabins USA to save with our special discount! Earn great savings on your Tennessee cabin vacation and enjoy everything that makes the Smokies one of the top destinations in the Southeast! Start the perfect honeymoon in Pigeon Forge with a romantic cabin for two with luxury amenities, unforgettable views, and a great spot close to downtown! Looking for a cabin near Downtown Pigeon Forge with an excellent view? Look no further than "Romantic Evenings" on Pine Mountain Road.